Understanding the range of possible climate change impacts on forests and the interactions between them is vital to sustainable forest management. We examine whether the combined influence of climate change and timber harvest will affect tree species distribution and productivity beyond predictions based on climate alone. We used the landscape disturbance model LANDIS-II to simulate two climate and two harvest scenarios in 14,000 ha of managed watersheds. The elevated temperature led to a decline in the abundance of boreal species and a substantial increase in some temperate and pioneer species. Importantly, the interaction of climate change and timber harvest yielded changes in the distribution of some species that would not be expected based on climate alone. Conversely, some late-successional species exhibited resistance to climate-driven changes in their distribution. Climate change caused an increase in forest productivity when harvest was simulated, but a decrease in no-harvest scenarios. A time lag in forest response was likely responsible for this decrease in the absence of widespread mortality. 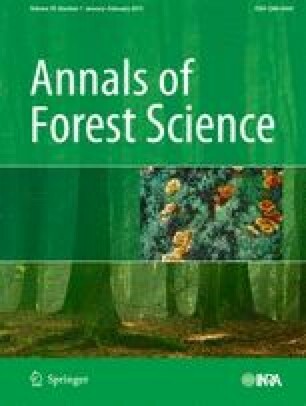 The finding that disturbance may drive the range expansion of early-successional broadleaved species and cause a decline of red spruce has implications for forest community associations, as well as for forest management where conifers are favoured for pulp production. James Steenberg was responsible for the experimental design, running the data analysis, and writing the paper. Peter Duinker and Peter Bush were responsible for supervising the work and providing input and manuscript revisions. We are thankful to Laird Van Damme and Arnold Rudy with KBM Forestry Consultants Inc., Robert Scheller at Portland State University, Barry Geddes with Halifax Water, the School for Resource and Environmental Studies and GIS Centre—Dalhousie University, and the Nova Scotia Department of Natural Resources. This project was funded by the Natural Sciences and Engineering Research Council of Canada (NSERC) and Halifax Water.